"Mom! Dad said to ask you if the tomAHtoes are done yet!" I used to love heirloom tomatoes best, but after I met dry farmed tomatoes, I barely looked back. Dry farmed tomatoes tend to be firm, on the small side, and I've only seen them in red instead of striped, purple or green. They look like a classic tomato—like those tomato pincushions that you might find in a sewing box. But unlike a pincushion (or any other tomato I've had) their flavor is intense and, frankly, outstanding. Tomatoes are everywhere lately. In fact, Wyatt and I recently saw a stunning sculpture made of tomatoes (the pincushion variety) at the Museum of Craft and Design in San Francisco. This piece, made of tomato shaped pincushions, wood, plaster, and mirrors is called "Rose Window," and it is part of Marianne Lettieri's exhibit, "Reflections." It is on display at the Museum of Craft and Design in San Francisco through January 22, 2017. I've been meaning to go to the Museum of Craft and Design since it moved to the Dogpatch neighborhood three years ago. When I learned that Poco Dolce chocolates was having their tasting week just a couple of blocks away, though, I suddenly decided it was time to actually go. I was looking forward to Marianne Lettieri's exhibit, which she obviously created with me in mind. As the website describes, "Reflections contextualizes overlooked relics of home making. The ritual of repetitive acts and the accumulation of objects in the domestic sphere each create a physical reminder of the passage of time." 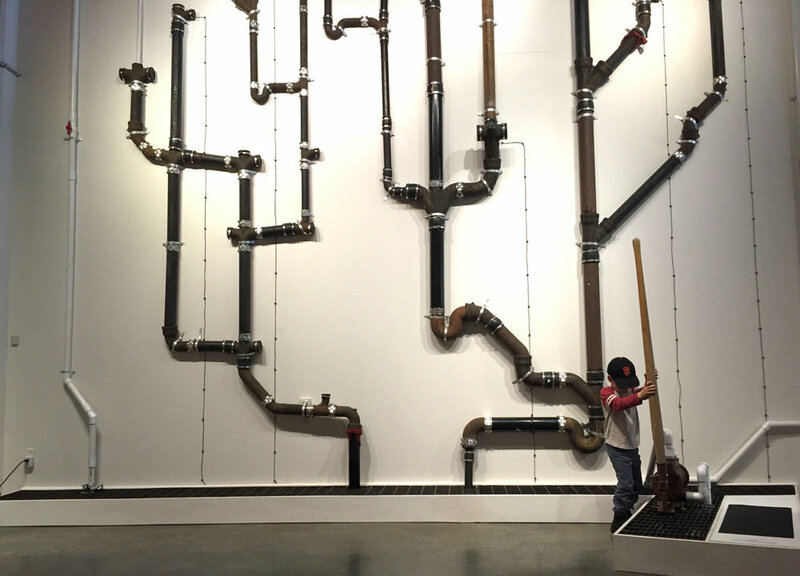 Wyatt was excited to pump water through Anja Ulfeldt's "Of Sound Mind and Objects" installation, "Domestic Infrastructure #2." After walking through all the exhibits, both of us considered the "Beyond the Pour" to be a delightful bonus. Seeing glimpses of artists' creative processes and how art can find its way on to a wine bottle was fun. "Sisters of Biscuits and Pies"
The chocolate tasting up the street was outstanding, too. After trying three of the chocolates twice (just to be sure we could rank them properly), we agreed that the Peanut Butter and Honey Cups were the best. On the way back to the car, Wyatt spotted an ice cream sign and thought that it would be best to see what they had inside. So we did. Sure enough, they had ice cream. Wyatt had bubble gum flavor and I chose toffee brittle. But back to tomatoes! Stuffed tomatoes, specifically. Until this weekend, I've never eaten one I loved, but I'm now a convert. On Friday, I heard a great review of Rachel Roddy's cookbook, My Kitchen in Rome. 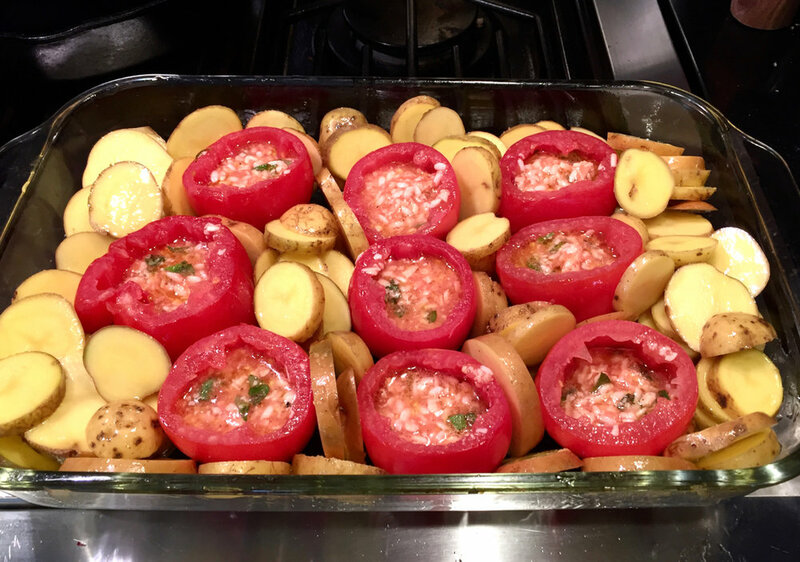 The commenters highly recommended her recipe for stuffed tomatoes. Lucky for all of us, the recipe is available online at Roddy's website and through The Guardian. The recipe takes awhile, although most of the time is waiting time. But I promise, it's worth it. In fact, all three of us agree it is worth every single minute. The recipe creates a baked, creamy and vibrant tomato-basil flavored risotto inside a beautiful tomato shell. I used dry farmed tomatoes, but choose whatever tomato you like the best. Roddy advises letting the arborio rice soak for at least 45 minutes. I let it soak for 2 hours at room temperature, and I'm glad I did. The rice had absorbed a lot more of the tomato juice at the end of 2 hours than it had after 45 minutes. The recipe The Guardian provides says to cut the potatoes (whose function, as far as I can tell, is to absorb the tomato juice in the pan--don't skip them!) into "chips." Had I consulted Marc for a British to American translation of this description, he would have told me "little wedges." I didn't consult, bought little potatoes, left them unpeeled, and I cut them into small rounds. This approach worked fine. If, like me, all of your rice doesn't fit in the tomatoes, oil a little baking dish and put the remaining rice in it. Cover the dish with an oven-proof lid or tight foil and pop it in the oven with the tomatoes. The rice cooks up perfectly, and it will be done when the tomatoes are done. Make more than you think you want to eat in one day. The tomatoes reheat extremely well, covered, in a 350 degree oven, with a splash of water in the bottom of the dish. Plan for leftovers! Hats back on! Ready for the oven. Baked, rested, and ready to eat!